Last week the Chicago Blackhawks officially hired Kevin Dineen, replacing Jamie Kompon as assistant coach to Quenneville. Kompon left to become the head coach and general manager of the Portland Winterhawks, a junior team in the Western Hockey League. While Kompon will be missed behind the bench, Dineen’s presence should prove to be an intelligent move by the Blackhawks. 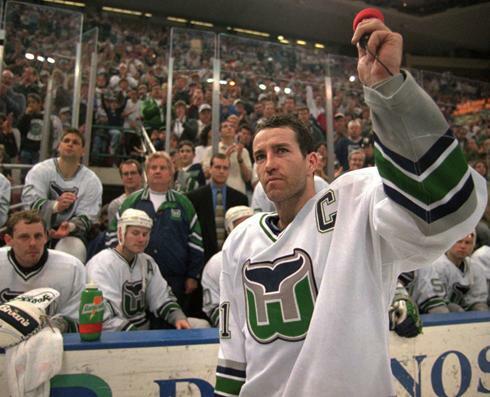 Kevin Dineen in his last game as a Hartford Whaler. Dineen and Quenneville have known each other for more than 30 years, even if they have never coached together. Dineen wore number 11 on the Whalers from 1984 to 1991, alongside his now-head coach, Joel Quenneville. The two played together from 1984 until 1990, when Quenneville moved from the NHL to the Baltimore Skipjacks, the then-AHL affiliate of the Washington Capitals. Since his retirement as a player, Dineen has coached the Portland Pirates, the now-rebranded Baltimore Skipjacks where Quenneville played the majority of a season from 1990-91. He was a familiar face behind the Panthers’ bench from 2011 to 2013, and most recently coached the Canadian Women’s Olympic team to victory in Sochi. Not only does Dineen have a tremendous amount of coaching experience, what stands out to me is that he coached the Canadian Women’s team. For a little bit of background on the situation, their coach quit only a few months before the Sochi Olympics. This obviously left them in quite a bind, but prior to that, they had lost to the U.S. four times in a row during their exhibition series. There had been two separate games (one in October, one in December) that made the news for brawling between the teams and resulted in far too many penalty minutes handed out. These ladies were in desperate need of a change, which Dineen provided. What came out of that was a team that played a fast skating game, complete with aggressive offense and loads of puck possession. If that reminded you at all of the Blackhawks: ding ding ding, you win the prize! The 2012-2013 Blackhawks, that is. The team we saw enter the playoffs this year was lackluster, a little tired. Too much so to win a Cup. While we can point out all the logical reasons for the Blackhawks to miss the Final this year — shortened offseason, sending an inordinate number of players to the Olympics, the infamous Cup hangover — the team lacked follow-through on its fire. The Hawks would play their hearts out one night, and barely seem to make it through a game the next. How will he help the ‘Hawks? Kompon was responsible for improving Chicago’s power play from 19th in the league to 10th by the time he left. Dineen’s focus on offense may fill in some holes that became evident over the past season. With the Cup win over a year behind them, a long offseason and time to rest and recover stretching out in front of them, Chicago will have a fresh start to the season with a highly skilled, deep roster. While changes still need to be made with the Blackhawks almost $2 million over the cap, the likelihood of Bowman losing core players off the roster is lessening every day, especially after so many fans turned out to see their favorite players at the Blackhawks Convention this past weekend. Dineen has a shot here to truly make his mark on what has the potential to be a Cup-winning season. Should he live up to our expectations, after Quenneville’s reign has come and gone Dineen will be poised to step into the head coach position. I think Coach Q still has a lot of time left in Chicago, but there’s no denying that you need to change the coach up minimum once per decade to keep things fresh and flowing. Once Quenneville decides it’s time to move on, though I pray that day is far in the future, Dineen will be in the perfect position to step up. He’ll be able to bring a new perspective to the table while already being a known quantity, and someone with a successful track record of working with these players. Who knows? Maybe we’ll see the ‘Hawks win a cup with Dineen’s name in the head coach’s spot within the next decade.